Over the past months, an argument to "delink" China from the U.S. economy has appeared in U.S. politics, amid escalation of bilateral trade frictions. American lobbyists are advocating complete abandonment of economic cooperation, involving the science and technology sector, investments, industries, education and shared talent pools. They believe China will not be able to survive such an initiative, whereas, the United States would be much less affected and could endure. However, I have many reasons for believing such actions will not turn out as expected. First, there is the enormous size of bilateral trade, which has grown from US$2.5 billion when the two countries established diplomatic ties in the 1970s, to US$600 billion last year, which will ensure neither side can emerge a winner. The United State is China's largest export market, while China is America's fastest growing export market. From 2001 to 2017, American exports to China grew by 577 percent, a rate far exceeding the 112-percent average increase to the entire global market. Despite the current trade friction, China's exports to America and bilateral trade in aggregation have been soaring rather than plunging. Although China's exports, which seem somewhat unprofitable in the U.S. market, may suffer a great loss following industrial diversion, with growing unemployment at the beginning, America will face an even greater loss in the long run. The intermediate costs of U.S. imports will soar, feeding into price rises for consumers, unleashing inflationary pressures. More importantly, a substantial portion of the Chinese market will slip from the hands of American businesspeople. 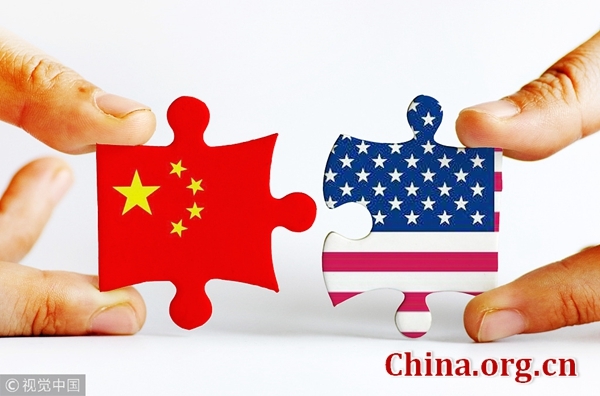 Although both countries will suffer in any disconnection, the difference is China's loss is partial and temporary, while that awaiting the United States is holistic and enduring. Second, the U.S.' voracious appetite for offshore funds from China makes any split a poor choice. Given the U.S. administration's recent attempt to impose security checks on foreign investment, bilateral investments, especially those from China, will nosedive. According to the Rhodium Group, a New York-based consultancy, Chinese investments in the United States in the past seven years have hit a low point of minus 83 percent. Direct Chinese investments reached a high of US$46 billion in 2016, falling to US$29 billion in 2017 and US$4.8 billion last year. Further diminution will occur this year. Without investment from China, rejuvenation of American industry is an empty slogan. The same applies to U.S. national bonds which count on Chinese purchase to maintain fiscal balance. Third, it will be difficult to break up the bilateral industrial and supply chains that are so closely interconnected. The industrial chains developed so far, incorporating automobiles, aircraft, telecommunication facilities, semiconductors, heavy equipment and daily consumption products (clothes, toys and furniture), are critical to the industrial structures at both sides. Although the Trump administration is imposing high taxation on Chinese products, a majority of the involved U.S. enterprises in China choose to stay, because substitution is hard for most established industrial chains, still less can they be transferred to China's neighbors, such as, India and Vietnam. India lacks the necessary manufacturing capabilities and Vietnam cannot be compared to China by market size. Those American entrepreneurs in China, whether investors or agents, who have protested against the increasing levies on the products made in China, will oppose cutting off bilateral economic ties. In addition to the latest launch of Tesla's factory in Shanghai, where an industrial chain of new-energy vehicles has been founded, American industries like those in the agriculture, energy and service sectors, in which the U.S. has been able to gain trade surpluses from China, will all suffer great loss in any rift. Fourth, the interconnection of science and high technology between the two countries is too strong to be dismantled. From now on, and over a very long period of time, American technology will remain superior to that of China. However, the gap is narrowing as China is beginning to excel in a few areas. China needs to learn from the United States, and that learning should comply with Intellectual Property Rights (IPR) rules. But now, the United States' efforts to block China in the field of science and technology go far beyond IPR protection. In the long run, such measures will impede the U.S. from maintaining its supreme high-tech advantages, as it will cut funds to small-and-medium-sized enterprises, reduce the market share and profits of the U.S. conglomerates investing in China and drain a major source of the American talent pool. In contrast, China will be motivated to develop its own sciences and high-technologies, consolidating domestic research and manufacturing capabilities to become more competitive. Fifth, there is a tremendous amount of interaction between the two countries and their peoples. The United States receives many Chinese tourists each year, with the number reaching 5.3 million in 2017. Hundreds of thousands of Chinese students are studying there, forming the largest source of foreign students in American universities and colleges. Many American investors hold shares of Chinese companies listed in New York and Hong Kong, and stock market stability is their biggest concern. Many provinces and states of the two countries have worked together to set up corresponding cooperative mechanisms, and more sister city ties have been established to extend the bond of shared interests. Some American states have promoted trade ties with China and enlarged investments in accordance with respective local legal procedure. More examples can be cited here. California alone accounts for one-fifth of the total bilateral trade volume. Washington state has furthered its trade ties with China in recent years. Many oil- and agriculture-producing states are highly dependent on the Chinese market. To sever the economic and trade ties with China will be a matter of life and death for these states, and undoubtedly exert a negative impact on their development. Sixth, macroeconomic coordination between the two countries has tremendous impact on the global market. Bilateral macroeconomic policy coordination mechanisms have been gradually shaped since 2008, with the China-U.S. Strategic and Economic Dialogue playing an indicating role for global economic performance of great significance. At the same time, bilateral coordination in macroeconomic policy tools, involving exchange and interest rates, finance, trade and investment, also plays a guiding role in the G20 coordination mechanism. In addition to global economic governance, other issues including WTO reform, tackling global warming, reform of the international monetary system and U.N. reform, also need close consultation between China and the U.S. Moreover, China's Belt and Road Initiative needs the participation of Western developed countries, including the United States, to make it more open, transparent and competitive as well as being guaranteed by international rules. In short, without Sino-U.S. cooperation, there would be no world market order. Delinking of U.S. and China economies is bound to cause great chaos in the global market. Since the Chinese and American economies are inseparable, why do some American politicians and strategists still persist in this call for the delinking? There are two main reasons. Firstly, it is a customary tactic for the Trump administration to impose extreme pressure on China in ongoing trade negotiations. Secondly, a group of American hardliners never considers the disastrous impact brought about by Sino-U.S. trade frictions on their own enterprises or on the world economy. Therefore, this delinking idea is neither the way out for the American economy, nor the way to ease economic and trade frictions. Only through negotiation can we find a solution to the longstanding problems between the two countries, promoting bilateral economic and trade relations, and turning crisis into opportunity. Clinging obstinately to the idea will be an incorrigible blunder. The author is a professor with Fudan University and an expert in American studies. The article was translated by Wu Jin and Li Jingrong from an unabridged version published in Chinese.